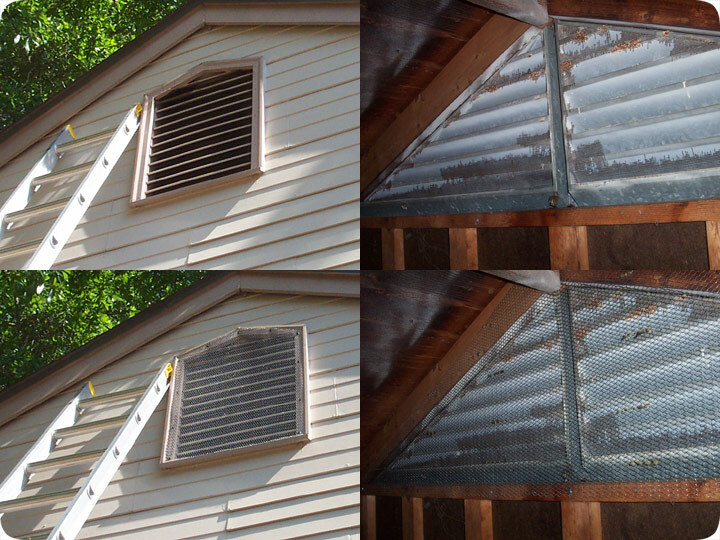 06.20.2004 - Attic vents are a common wildlife entry point, particularly for squirrels and rats. The above photos were taken at two different homes, one of which had a squirrel problem, and one of which had a rat problem. The rodents were entering the attic through improperly screened vents. You can see in the photo on the right that this vent used to have a screen of some kind, but it was very flimsy, and it eroded with time. Rats were able to easily climb right into the attic. I sealed off the vents with a heavy-duty steel screen. In the photo on the right, squirrels were using the attic. There was no screen at all installed on this louver vent. You can see that the squirrel did some chewing in the upper-right corner of the vent - not because it needed more room to get in, but because squirrels often chew at the entry hole. This building did not have any attic access. Thus, I installed a new steel screen from the outside, instead of the inside. Of course, I didn't install this screen until I had removed all the squirrels from this attic - they'd have gone nuts chewing out the wood had I sealed them in! So if you have a critter problem in your attic, check your vents, and make sure that they are properly sealed, preferably with a heavy-duty steel screen. Remember, the most important step in a total wildlife control solution is to stop the source of the problem - if you have wild critters in your attic or home, the only way to permanently solve the problem is to close all the entry points! This is a special skill, and it requires extensive knowledge of both architecture and animal behavior. Being a skilled repairman also helps. All repairs should be done in such a way that keeps animals out for good - this often means sealing with steel, and sealing openings so that they are airtight, with no trace of airflow for animals to detect. Remember, rodents can gnaw through almost anything, and raccoons can tear through almost anything. While it's important to trap and remove animals, and clean up the waste they leave behind, the most important step in solving the critter problem and in keeping animals out forever is to identify and repair every last critter access point into the building. Without this crucial step, the job isn't complete. Do it yourself: Visit my How To Do Wildlife Repairs page for tips and advice. Learn more: Browse my Examples of Repair Jobs blog to see some wildlife repairs in action. For more wildlife stories, click my Wildlife Blog, or click my below banner to hire a local trapper.